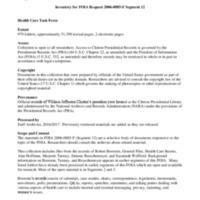 Identifier is exactly "2006-0885-F Segment 12"
This collection is the twelfth segment of materials related to the Health Care Task Force. It includes the files of Robert Boorstin, Alan Hoffman, Marjorie Tarmey, Simone Reuschemeyer, and Susannah Wellford as well as some material from the General Files and Health Care Interns. The files contain briefing materials, chron files, correspondence, legislation, press materials, scheduling materials, and speeches. Subjects covered include various aspects of Clinton health care reform and health-related issues.